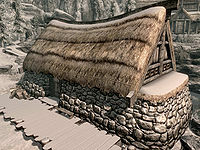 Brina's House is a small house in Dawnstar, located next to Leigelf's House, opposite The Mortar and Pestle. It is the home of Brina Merilis and her guard, Horik Halfhand. It consists of one area only: Brina's House. The house faces the bay and has a decking out front. There is a wooden bench and pile of firewood on the decking. The door is novice-locked when neither of the residents are home. Horik Halfhand acts as Brina Merilis's housecarl or bodyguard, and as such travels around the town with her at all times. It is a typical one room dwelling. On your left as you enter there is a chair and food barrel in the corner, beside which, against the east wall, is a cupboard holding four bottles of wine and two bottles of alto wine. There are more barrels in the southeastern corner. Against the south wall there is a long wooden table holding two bottles of alto wine and a bottle of Nord mead, with three garlic braids, two bunches of elves ear, a bunch of frost mirriam and a rack holding three rabbits and three pheasants hanging above it. Further along to the right there is a food barrel and a set of shelves holding four more bottles of alto wine and four bottles of wine. To the right of this, still on the south wall is a fireplace with a cooking pot in front and a kettle containing two leeks on the hearth. To the right of the fireplace there is a pile of firewood and a basket containing a copy of the One-handed skill book The Importance of Where. 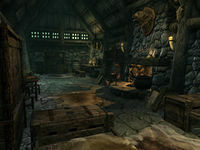 Coming out from the west wall are two owned single beds with an end table holding a bottle of Nord mead and an unlocked chest at the foot of each bed, both of which contain leveled items. Against the north wall is a tall wardrobe containing clothes, with a steel mace on top. To the right of it, next to the door, is a small round wooden table and two chairs. On the table is a bottle of alto wine, a bottle of wine and two loaves of bread. With the exception of most barrels and sacks, all containers in the house are non-respawning and safe to store items in.